After reviewing series one, I guess it's only right that I should watch the second series too. While I wasn't totally satisfied with the first series, there was enough there to keep me interested and wanting to know what happened next. 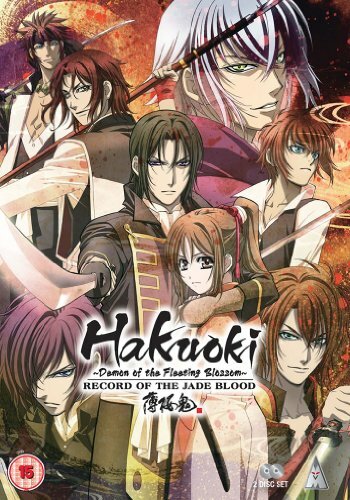 The “Hakuoki Series Two Collection”, which was released on DVD in the UK earlier this month, is a two-disc set containing ten episodes, five on each disc. The series continues straight on from where series one left off. If you haven't seen that, I suggest you watch it before reading on, as I don't want to give anything away (although I always try not to). It's January 1868, and after being overwhelmed by the fire-power of their opposition, the Shinsengumi know their swords are no match for their enemies' guns, so must retreat to Edo. Hijikata is not eating; he's tired, fatigued, irritable from working non-stop, and he's struggling to control his “darker” side, as are some of the other Shinsengumi members. With the Bakufu defeated, and no longer in power, the Shinsengumi now have no official position, and are enemies of the Imperial Army, who have taken over from the Bafuku. They find themselves battling it out against increasingly powerful opposition. Can Hijikata rally his troops and come out on top? Series two sees the fortunes of Chizuru and the Shinsengumi take a turn for the worse, with the latter facing ever-increasingly overwhelming odds, the series begins on a downer. Things get worse as the Shinsengumi continue to fight battle after battle, each time against seemingly stronger and tougher opposition. As with the first series, the story continues against a backdrop of actual events from Japan's past, with many a historic battle taking place. There's considerably more action in this series than in the first, with one skirmish after another, and a few one-on-one encounters occurring throughout. In fact, there's at least one fight per episode, so if action is important to you, and the presence of “Warrior Spirit” floats your boat, then there's much for you to enjoy here. Sometimes though, I found that I got a little lost with all the factual elements of the series. If you have a good knowledge of Japanese history, then perhaps you could enjoy it a little more (I guess the average Japanese person knows a little more about this sort of thing than your average westerner). For those who are more into the relationships side of things, this series also ups the ante in terms of romance, with Chizuru's feelings growing ever stronger for one member of the Shinsengumi. What was only hinted at previously, now blossoms and is there for all to see in series two! As such, there's a fair bit of soppiness this time around; a little too much for me, but like I said in the series one review, I'm not part of the target audience of this anime, so I can forgive it for that. I had also commented, that I thought Chizuru was a bit pathetic; this time however, she is given a chance to show her strength a little more in how she stands by her friends, and stands up to a certain devil to protect the injured Kondou. It's nice to see that her character has evolved a little, and isn't just the helpless young woman unable to stand up for herself, like she kind of was in the first series. With several characters switching allegiances, the exploration of Chizuru's origins, and the development of her romantic feelings, along with the supernatural storyline, and the involvement of her father, there are quite a lot of plot elements to enjoy here. I would probably have preferred it if some of these were explored in greater detail, but as it stands, the series was quite satisfying. The story seemed to move along at a slightly quicker pace than the first, however there were times that I still wished things would move on a little more rapidly. As with the first series, I opted for the Japanese language version, this time almost avoiding the English dub altogether. I listened to it for about two minutes, and was still of the opinion that not all of the English voices suited their corresponding character. Again, the Japanese voice acting was decent and believable, but unfortunately the subtitles contained a few errors, just like in series one. Again, not much change this time, in that it all looks great, with some nicely illustrated background artwork, along with some well animated action. The fast-paced sword fighting scenes are particularly well executed. The only extras contained in this DVD package are clean opening and closing animations. A bit disappointing again then; perhaps some kind of historical features would have been nice, and could have spruced the package up somewhat, but alas, it wasn't to be. This is a much more action-packed series than the first one, and in that sense, the story seems to move along at a brisker pace, and therefore a little more enjoyable. The development of Chizuru's character and her blossoming love also helps to keep viewers interested. It's still a little heavy on the historical side for my liking, but if this aspect interests you then there's much more to appreciate in watching this. The series as a whole was an improvement on the first, however I'd have liked it more had there been further exploration into Chizuru's father's involvement, and also the devil part of the storyline. All in all though, it's a nice follow-up to the first series, and worth a watch through to it's slightly ambiguous climax. Hakuoki Series Two Collection DVD is out to buy now. Im Sang-Soo brings to us a Korean tale of corruption and family, but not necessarily in that order. When it comes to the two in fact, it quickly becomes apparent that director’s take is that they are not mutually exclusive. Focusing on a rich, powerful, not so law abiding, family and their internal power play for the family fortune this movie quickly devolves into less of an epic familial struggle and more of a TV drama. Japanese director Sion Sono, whose previous work includes Love Exposure and Himizu, is back with this thought provoking family drama focused around their struggle to function as a unit in the fallout of, get this; not only an earthquake, but a subsequent nuclear crisis. Focusing primarily on Yasuhiko, played with doe eyed conviction by Isao Natsuyagi), patriarch of this troubled family, as well as his son, Yoichi Ono and their fracturing relationship. Throw in Chieko, Yashuhiko’s alzheimer inflicted mother, and Yoichi’s responsibility to his wife and her unhealthy burgeoning habit in radiophobia, and you’ve got a melting pot of family dissent and friction. Earls Court Two plays host to the fifth Hyper Japan event this weekend, spanning from Friday the 26th through to Sunday 28th. During this time you can easily find an eclectic array of things to do, see and experience; all firmly rooted in that popular common denominator that is Japanese culture. Purported to be the “one stop destination for all things Japanese”, I wandered the walkways, soaking in the atmosphere in order to bring you anime boys and manga girls the details straight from the floor and, importantly, to see whether they truly live up to their words. Working for UK AniFest these past few months has allowed me a unique insight into a lot of things in relation to anime; its fans, its culture and, of course, the convention circuits that accompany the bloggers lifestyle. I've since experienced the MCM Expo as well as the London Film and Comic Con thanks to Tobika (be sure to check out my thoughts on these by hitting the links), so it was with genuine interest that I attended 2013's London Anime Con, now in its 7th year and hosted at The Rocket Complex in Holloway Road, London. How would I, The Other Guy; the guy who stands out on an anime site as the person who kind of talks about, well, anything and everything, react to a convention that is purely focused on anime and its culture? Accompanying the boys from ToyMation, I set out to explore and experience what this convention had to offer. UKAnifest is fully independent. The views expressed on this website are not necessarily shared by UKAnifest / Toymation Ltd. We are not paid by publishers, anime studios and film studios to positively review any title. We remain honest to our writers and bloggers for you, the reader.